Summary: don’t throw your money away!! This charlatan of tuners is inaccurate, the strobe is a fake, and it can’t even properly evaluate its own tones! General speaking, any electronic tuning device which provides a visual indication of the amount of detuning is inherently less accurate than the human auditory system. The one exception to this rule is a stroboscope, which, under certain limited circumstances, can be of invaluable assistance, even to the practiced tuner. Therefore, when I first ran across a reference to insTuner which stated that the app included a stroboscopic display, I was very excited about the possibility of having a strobe on my iPhone, and I immediately bought the app. Unfortunately, I am sorry to report that it is far from perfect; in fact, it is so bad that I do not recommend anyone waste their money on it! 1. It is unduly susceptible to differences in spectral content. 2. At lower frequencies, it gives widely inaccurate readings. 3. The “strobe” is not a real strobe, but a fake strobe display based on a discrete analysis of the sound. Regardless of what type of display is selected or what degree of display damping is employed, the app will return markedly different indications with different harmonic spectra. It does reasonably well with pure sine tones as well as square and triangle waves, but when sawtooth or irregular complex harmonic tones are used, the reading will change, sometimes by more than 4 cents! For example, a sampled tone of an 8′ Gamba organ register caused the note Eb in the tenor octave to read +4,6 cents, while the same frequency presented as a sine wave was displayed correctly. Bear in mind that these tests were made under ideal conditions: a steady electronically-generated tone and a quiet ambience. Under real-world conditions, the response will only be worse. These three screen shots show insTuner evaluating its own generated tone for the note tenor d (146,83 Hz) which is being fed to a high-quality stereo with large speakers. The first image shows the response to sawtooth and square waves, the second to triangle, and the third to a pure sine wave. These errors far too large to be acceptable, as the human ear can easily out-perform the machine. The first two problems are already bad enough to condemn the app to the junk heap, but in my opinion, they pale in comparison to the most grave error committed by the app’s developer: false advertising! One may forgive a device for returning erroneous cents deviation readings, since they require some sort of discrete analysis and calculation, all of which can introduce errors. However, a right and proper strobe is not susceptible to such errors, for it functions by making a real-time combination of the actual sound with the reference tone, and the combination of two periodic waveforms (regardless of their spectral content) of exactly the same frequency will always generate a stable visual pattern, whether it be on a stroboscope or on an oscilloscope with both channels combined, drawing either the summed wave form or a Lissajous curve. This is not the case with insTuner, however. The ostensible strobe display drifts left or right in accordance with the erroneous cents reading, even when the sampled frequency is identical to the internally generated reference frequency. This can easily be proven by letting insTuner analyze itself. 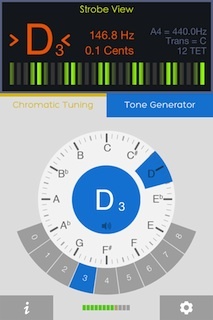 The tone generator function can be engaged simultaneously with the meter function, and if the generated tone is fed to a good stereo system so as to assure proper low frequency content, beginning around tenor d downwards, it will inevitably indicate that its own tones are markedly out-of-tune! However, when compared to an external reference source, either a synthesizer of a lab-grade frequency generator, it can be proven that the insTuner generated tone is in fact correct. It appears as though even when the strobe display is selected, the app is still only analyzing the sound by a process which returns a quantification of the error in discrete units (i.e. frequency domaine), and then, using this information, it turns around again and converts this (often erroneous) information back into the time domaine, creating an animation of a faux strobe display. The real process is probably an FFT algorithm, since both FFT and spectrogram are options for display, both of which are utterly pointless for tuning as they lack any real accuracy. As any acoustician knows, FFT takes time, and the lower the frequency and the more accuracy you demand (more spectral lines), the more time is needed. It is likely that the developer has limited the accuracy of the FFT in order to avoid an undesirable amount of latency, which is why problems appear in the tenor octave, and the lower the frequency, the worse the trouble. Needless to say, such a process completely destroys the inherent advantages which make a real strobe so valuable: no latency and infinite resolution (i.e. no increments in the display of information)! It also undermines the accuracy of the device in the simple cents deviation mode. UPDATE: 25 June 2013. Another test which proves that insTuner’s strobe is NOT a real strobe, but merely a fake strobe-like animation generated by the cents offset calculation. The app was given sine waves generated by Absynth with the synthesizer tuned 4 cents sharp. This meant that ALL notes were exactly 4 cents sharp. However, since a strobe works by visualizing interference, a real strobe display will drift faster or slower depending upon the octave. Every time the pitch goes up an octave, the speed of the pattern drift will double. The insTuner “strobe”, however, does no such thing. All 5 octaves tested produced the same cents offset reading AND exactly the same “strobe” pattern drift speed. Beyond these problems with the visual display of tuning error, the app appears to be OK. Generated tones appear to be what they say they are. As for the temperament selection, as with ClearTune, the author has grabbed a bunch of temperaments from some modern source, and there is no way of knowing exactly what one is getting. For example, the user is left to puzzle-out for himself what is meant by “Neidhardt I”, “Neidhardt II” and “Neidhardt III”, or “van Zwolle”. The situation is greatly aggravated by the fact that there is no option to program your own temperaments. Furthermore, the tuner only allows using A as the reference note. insTuner has been getting a lot of positive press lately, and the author has a very slick web page with lots of cool screen shots and positive testimony, making all sorts of claims about high accuracy and such. However, don’t get suckered-in by all the false sales blah-blah, nor by the praise heaped upon it by other reviewers who just fiddle with the device and never really verify its performance in a proper scientific manner. The app does have a nice interface, and if it worked as claimed, it might be tempting… were it not for the problems of the temperaments and the reference pitch. I’d give it half a star for good intentions (out of 5 stars). The performance of insTuner was evaluated by giving it a number of electronically-generated sounds as well as analyzing its sound output. The app was running on an iPhone 4 under IOS 6.1.3. The computer used was a MacBook Pro 2.4 GHz Intel Core i5 running OS 10.8.3. Audio input was through an iMic USB adapter. Audio output was through the built-in audio jack. Test tones were generated using Native Instrument’s Absynth 5 synthesizer, which can alter the frequency of the generated tones to an accuracy of 6 decimal places in both MIDI note values (i.e. 4 decimals in cents) or ratio from the generating note of middle c (MIDI 60). Tones were reproduced using a high-quality stereo system with large speakers to assure low frequency content. Separate spectral analysis of the tones proved that fundamental frequencies were always clearly present. insTuner’s generated sounds were analyzed for spectral content and accuracy using Faber Acoustical’s SignalScope Pro (2.1.10) using FFT and oscilloscope functions. The accuracy of both Absynth and SignalScope has been previously verified using lab-grade external test equipment in the electronics lab where I teach. Note: all reviews of all apps are kept up-to-date, that is, whenever a new version of the app appears, I check to see if any major changes, either positive or negative, have been made. Since iPhone apps are automatically updated, it is safe to assume that at any moment the review refers to the most recent version. The same holds true for the iOS version. Currently, I have an iPhone 4 and an iPad mini retina. Latest update: 31 July 2014.